Focusing on health and nutrition, the new Nutrition Science for Fitness and Wellness Professionals continuing education course from Wexford University is available online. Registration and details are available at http://wexford.edu/continuing-education-courses-for-health-fitness-personal-training-nutrition-and-sports-coaching-professionals/. You can earn your "Certificate of Advanced Achievement" and get credits for most fitness and sports associations. While babies only consume a few ounces of food a day, people’s needs and preferences for food continue to evolve throughout the human lifespan. With that in mind, Wexford University, a 100 percent online university with flexible scheduling and affordable tuition, now offers a continuing education course in Nutrition Science for Fitness and Wellness Professionals. The course, which results in a Certificate of Advanced Achievement, is available at http://wexford.edu/continuing-education-courses-for-health-fitness-personal-training-nutrition-and-sports-coaching-professionals/. The introductory nutrition course focuses on a scientific investigation of the nature, the role and metabolism of nutrition in human health at all stages of life – from childhood to the elderly – with an emphasis on digestion, absorption and metabolism of food and nutrition as well as planning dietary intake. 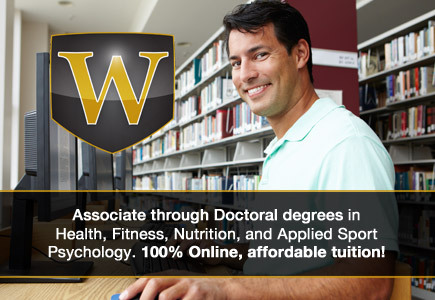 The comprehensive and interactive classes involve direct communication with instructors, online learning using video, manuals and discussion, direct application rather than just theoretical learning, ongoing quarterly classes as well as the opportunity to later apply for Wexford University’s online degree programs.